Thanks so much for the question littlecoco7. The mug shots of the conspirators are very valuable resources to us now. For George Atzerodt, Michael O’Laughlen, and Edman Spangler, these few shots consist of our entire photographic record of their lives. 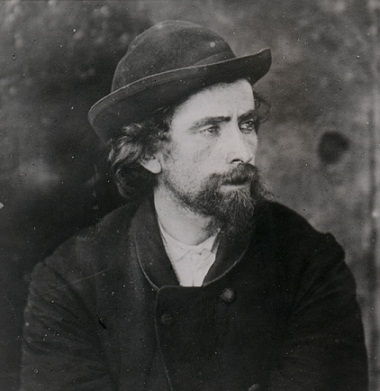 While engravings and drawings were made of them during their time in the court room, we have yet to find other photographs of these individuals. 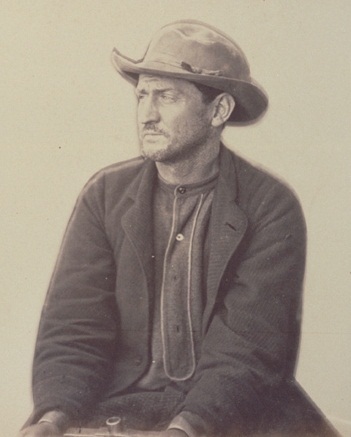 Even those who we do have additional images of, the mug shots are unique in showing them as they were almost immediately after the crime was committed. Before delving into your question as to why Mary Surratt (and Dr. Mudd for that matter) were not photographed with the rest, let’s look into how and when the conspirators were photographed. The best resource for information about the images of the conspirators is the team of Barry Cauchon and John Elliott. These talented gentlemen are in the process of writing a highly anticipated book regarding the incarceration of the Lincoln conspirators. One of my links on the side of this blog is to Barry Cauchon’s blog, “A Little Touch of History” while the pairs’ Facebook page about their book, “Inside the Walls” is here. Barry and John presented some of their findings at the 2011 and 2012 Surratt Society Lincoln Assassination Conferences. Their research was remarkable to say the least. To keep their excited fan base content while waiting for the final publication of their book, they produced two supplementary booklets about their talking points. The most recent one that they sold at the 2012 conference was entitled, “13 Days Aboard the Monitors” and delved into the mug shot photo sessions and the hoods worn by the conspirators. All the information in this post can be found in this terrific booklet and is currently available for purchase through Barry and John and the Surratt House Bookstore. Through the research of Barry Cauchon and John Elliott we believe that three photograph sessions occurred while the conspirators were imprisoned aboard the monitors Saugus and Montauk. 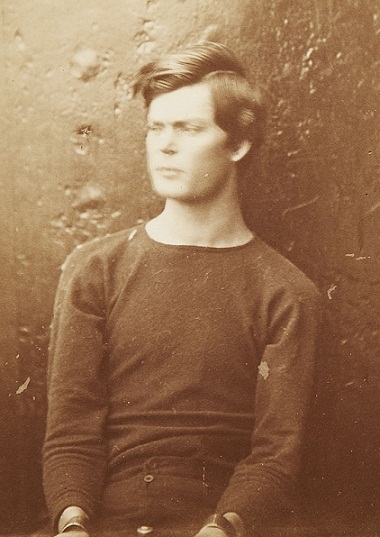 The first set of images were all taken of a standing Lewis Powell wearing the clothes he was found in and the clothes he was wearing when he attack Secretary Seward. There were a total of six pictures taken on this day, April 18th. Carte-de-visites of two of the six photographs taken of Powell on April 18th. At this point in time, only two of the conspirators were being housed on the monitors; Michael O’Laughlen and Lewis Powell. 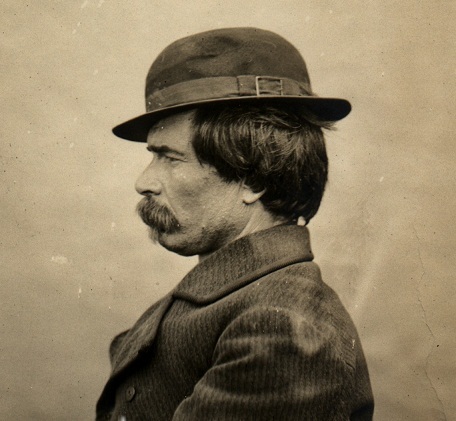 Gardner came back to photograph the conspirators on April 25th. By this point all of the main conspirators except for Booth and Herold had been arrested. Gardner photographed Powell again, along with Michael O’Laughlen, George Atzerodt, Edman Spangler, Sam Arnold and Hartman Richter. Richter was a cousin of George Atzerodt’s and was hiding George in his house when the authorities caught up with him. While Richter would be cleared of any involvement in the conspiracy to kill Lincoln, in these early days of the investigation he was locked up and photographed with the main gang. 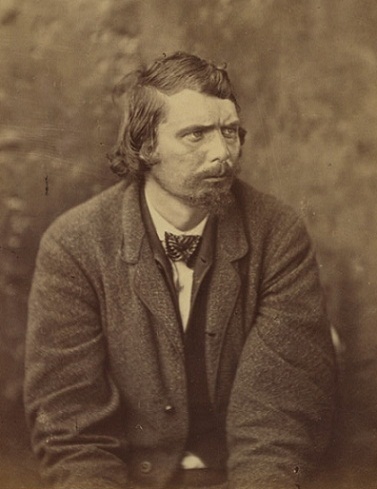 Finally, on April 27th, Gardner returned for his last photograph session. 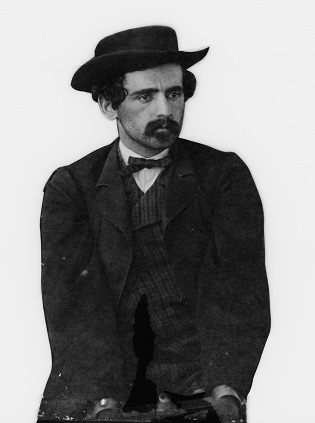 Here he took pictures of the recently captured Davy Herold and another conspirator Joao Celestino. Celestino was a Portuguese ship captain with an intense hatred for William Seward. 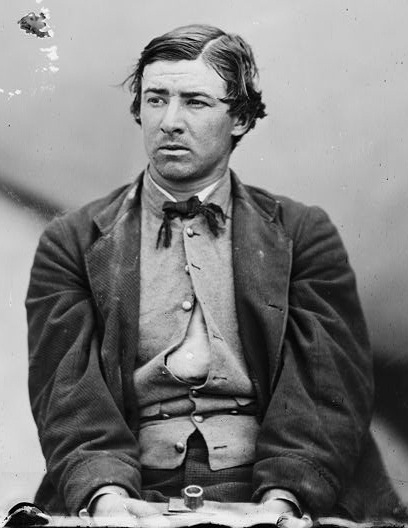 It was thought he was involved with the attempt on the Secretary’s life but was later released as no evidence existed to connect him to Booth’s plan. It has also been written that Gardner and his assistant took one photograph of the autopsy of John Wilkes Booth. The single print of the event was apparently turned over the War Department but has never been found. If it was taken, it was either destroyed shortly thereafter, or still remains undiscovered somewhere today. In the wee hours of April 29th, the conspirators on were transferred off of the monitors and into the Old Arsenal Penitentiary. So, why didn’t Mary Surratt and Dr. Mudd get their pictures taken? In short, they were not photographed because they weren’t there and their complicity in the affair had yet to be determined. Though Mary Surratt had been arrested when Powell showed up at her boardinghouse at the most inopportune time, she was not imprisoned on the iron clads. Instead, she and her household were sent to the Old Capitol Prison merely as questionable suspects. The same held true for Dr. Mudd who joined others involved in Booth’s escape like Colonel Samuel Cox, Thomas Jones, and Thomas Harbin, at the Old Capitol Prison. In the initial stages of the investigation, Mary Surratt and Dr. Mudd were not seen as conspirators. It was not until more and more evidence arose pointing towards their foreknowledge and association with the assassin that they were treated less like witnesses and more like accomplices. About the Booth autopsy photo: –The late Joe Lynch was a charlatan dealer in Americana who claimed to have discovd the missing pages of Booth’s diary and portions of ropes that hung 2 of the conspirators. He said that he found them in the possession of an old lady who had called him to appraise some of her things. The lady revealed herself to him as an heir of Edwin Stanton’s.. .Lynch also claimed that this Stanton heir, (whose name he could not reveal) also had the orig. glass plate photo that Gardner took of the Booth autopsy. This would have been the picture that was made into a woodcut for Harper’s Weekly (or was it Frank Leslie’s?). Such woodcuts were, indeed, based either upon photos or eyewitness sketches. However, when the late James Hall proved — merely from a transcript — that those missing pages were fabrications, and that the Stanton heir likely did not exist, doubt was immediately cast upon Lynch’s claim about the autopsy photo. Lynch always asserted that he didn’t have access to the genuine articles bec. the Stanton lady kept them in a bank. (A safe deposit box?). She only took them out for him to appraise and then sent them back. He wasn’t allowed to photograph anything, but he was allowed to make a taped transcript of the diary entries and then type it up. He was able to buy the ropes from her. (Smells, doesn’t it?) , He died without leaving us any more clues about it., and it was no doubt a big hoax. What is tantalizing is that the ropes I mentioned really do exist, and Dr. Lattimer’s family still owns them, having bought them from Lynch’s middle man, a gun dealer whose name I think was Weisberg.. The trouble with them is that other than Lynch’s word, there is absolutely no provenance to them. I am simplifying this story. There is really more to it, and it can be read in Ed Steers’ book, “Lincoln Legends.”. I often wonder if the print of the autopsy photo, from which the woodcut artist worked, still exists somewhere. I meant to write that Dr. Lattimer bought the ropes, not “the Lattimer family,” who still owns them..
Great post, Dave as always. 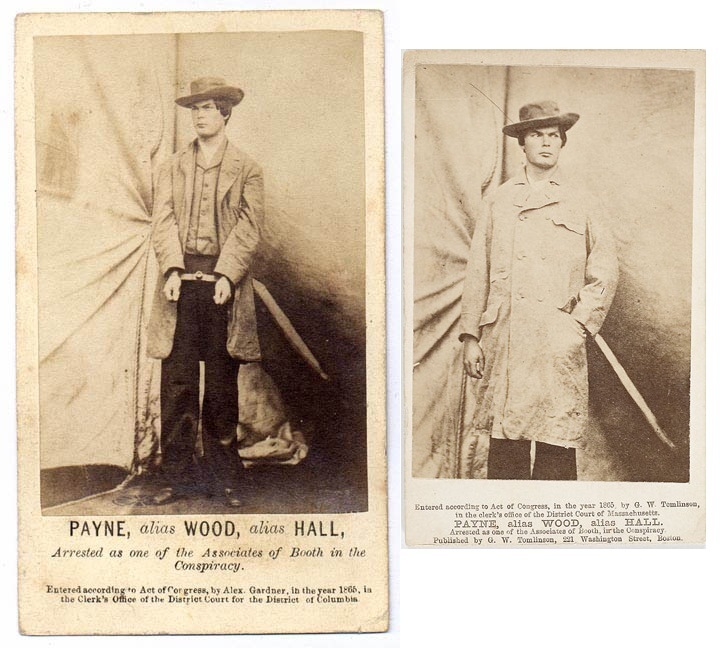 Apparently Gardner was fascinated with Powell as he took more photographs of this young conspirator than of any other. Barry and John took great pains to determine the exact dates of the photograph sessions. Richard – it’s good to know that the Lattimer family kept some of the acquisitions…..
Great sales pitch Dave. I am going to purchase John and Barry’s booklets. You won’t regret it, Rich. John and Barry are the you and Jim Garrett of the imprisonment realm. Dave- Thanks for answering my question in such a detailed manner. I didn’t even realize that Dr. Mudd had not been photographed either. Sorry I started a new post this way, but I couldn’t figure out how to start a new post. By the way, I was previously from the Lincoln-assasination forum. I was Angels0618 there. I couldn’t understand where all the people who posted all the time went? Then I found this new Lincoln forum and recognized alot of people. Glad I found this Dave. Do you mind me asking why everyone moved here? I look from time to time on the Randal Berry’s forum, and there are hardly any posts? Great job Dave in your forum. Best of luck to you. Thanks for the kind words.The reason you had such difficulty in “starting a post” as it were, is because this website is a personal blog rather than an open forum like Roger’s or Randal’s. I’m the only one who can create new posts here. I started it to showcase some things I had learned and wanted to share in my own way and so a blog was the perfect design for it. Every once and awhile I can come up empty when trying to think of a new post, so comments like yours really help me to know what my readers would like to know about. With regards to the changing demographics of various forums, all I can say is that when a group of people converse over the internet there are bound to be conflicts and misinterpretations. When such problems escalate, intense feelings occur on both sides. 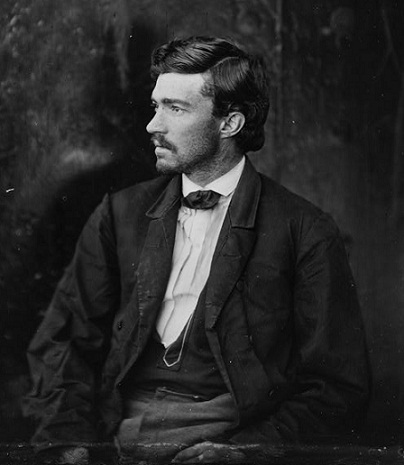 Regardless of personal issues, both Randal’s forum at Lincoln-Assassination.com and Roger’s forum at http://rogerjnorton.com/LincolnDiscussionSymposium/index.php are terrific resources. I encourage you to join and participate in both. Dave- I got the message. Your’e doing a great job. It’s nice to see familiar names again. Kudos on another great post, Dave. I did my personal speculation on the Lincoln discussion site of what conceivably happened with the pistol Lincoln may have carried with him to Ford’s Theatre. Here’s my personal guess on what happened with the photo of Booth’s corpse. 1. Gardner and O’Sullivan gave the plate and print to James Wardell. 2. Wardell gave them to Baker. 3. Baker gave them to Stanton. 4. Stanton, not wanting Booth to have the publicity of the photo possibly being in public circulation, destroyed them. It would be great if we had a “Ron Rietveld” type discovery of this, but my humble opinion is that it probably is gone for good. I lean towards the same direction as you Roger. To me it is more probable that the print was destroyed long ago and thus it will never be found. But still I hope that it wasn’t destroyed. I will hold out for the small chance that there is a picture in a collection somewhere labeled as merely an autopsy and that one day someone with knowledge on the subject will look at it and say this is the autopsy of John Wilkes Booth.